A parliamentary report of 1777 recorded local workhouses in operation in Corbridge (for up to 100 inmates), Hexham (55 inmates), and Horsley (8 inmates). An 1827 directory noted of Hexham that "The Workhouse is at the head of Priest-popple, where Mrs Mary Hutchinson, the governess, supports each pauper at the rate of 2s.6d. per head weekly. The poor of other parishes are taken in on the same terms, by paying an additional sum, not exceeding two guineas, yearly." 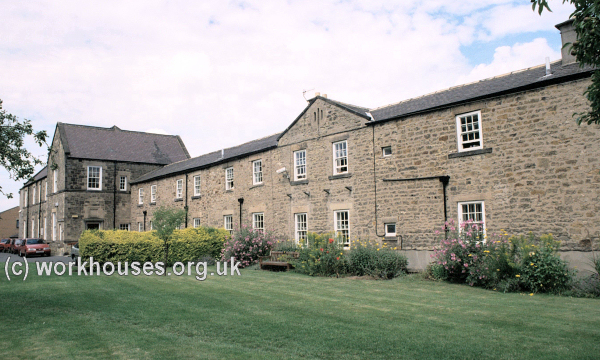 The same publicateion described the Corbridge workhouse as "a plain building, situated in Watling-street, where Mr. James Bowman presides as governor." Northumberland: Acomb, Acombe East, Allendale (6), Anick Grange, Anick, Apperley, Aydon Castle, Aydon, Bearle, Bingfield, Blanchland High Quarter, Broomhaugh, Broomley, Bywell, Chollerton, Clarewood, Cocklaw, Corbridge (2), Dilston, Dukeshagg, Eltringham, Espershiels, Fallowfield, Hallington, Halton Shules, Halton, Haydon (2), Healey, Hedley, Hedleywoodside, Hexham (5), Hexham High Quarter, Hexham Low Quarter, Hexham Middle Quarter, Hexham West Quarter, High Fotherly, Horsley, Houghton, Humshaugh, Mickley, Nafferton, New Biggen, Newbrough, Newlands Newton Hall, Newton, Ovingham, Ovington, Portgate, Prudhoe Castle, Prudhoe, Riding, Sandhoe, Shotley Low Quarter, Simonburn, Slaley Out Quarter and Slaley Town, Spittle, Stilling, Stocksfield Hall, Styford, Thornborough, Wall, Warden, Welton, Whittle, Great Whittington, Little Whittington, Whittonstall, Wylam. The population falling within the union at the 1831 census had been 27,271 with parishes and townships ranging in size from Spittle (population 7) to Allendal (5,540) and Hexham (4,666). The average annual poor-rate expenditure for the period 1834-36 had been £8,912 or 6s.6d per head of the population. Hexham main building from the south-east, 2001. The area between the accommodation blocks formed yards which were divided up to keep the various classes of inmate separate. Hexham southern yard from the east, 2001. 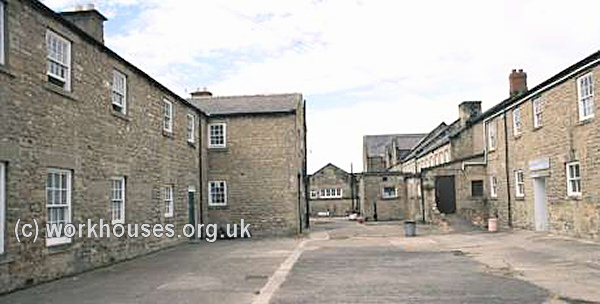 The original workhouse sick wards way have been in one of the blocks at the east of the building. Hexham original sick wards(?) from the south, 2001. In 1863, detached schools were built — an 1866 report noted that "the boys sometimes dig and plant the garden; the girls sew and knit, and the elder assist in milking and churning, for which purpose two cows are kept." The 1883 extensions at the west of the site included an administration block and Master's house flanked by sick wards for male and female patients. Hexham 1883 extensions from the south-west, 2001. Hexham 1883 sick ward from the south-west, 2001. 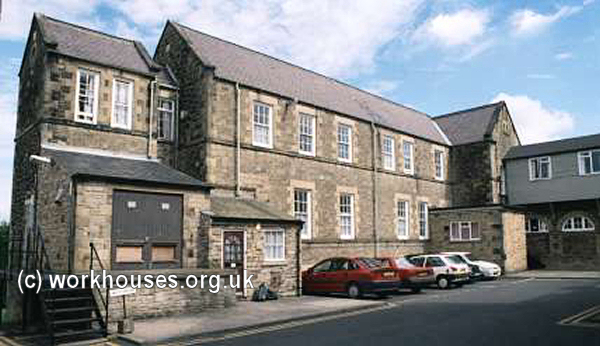 After 1930, the workhouse became Hexham Public Assistance Institution. During the Second World War the buildings were adopted for administrative use. Following the introduction of the National Health Service in 1948, the site became part of Hexham General Hospital. 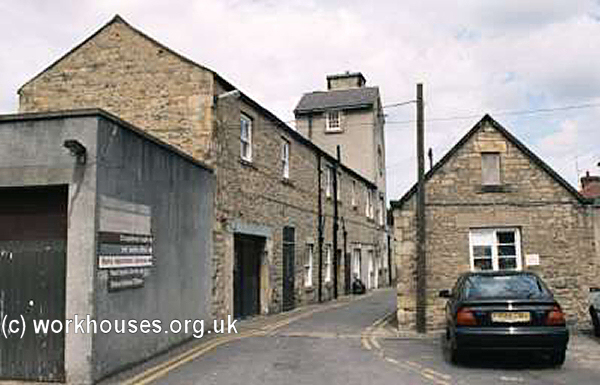 In more recent times, most of the former workhouse buildings are now used for administrative purposes and then for a period in residential use. In 2014, the buildings were empty and rapidly declining. The Hexham Union established a home, known as Fellside (or Fell Side), which housed about children. Its location is unclear but was presumably in the area of that name about a mile to the south-east of Hexham. Northumberland Archives, Woodhorn, Queen Elizabeth II Country Park, Ashington, Northumberland NE63 9YF. Holdings include: Guardians' minutes (1836-1930); Ledgers (1836-1930); Letter books - out (1881-1927); etc.